The British Gazette » What are the chances of winning the lottery? 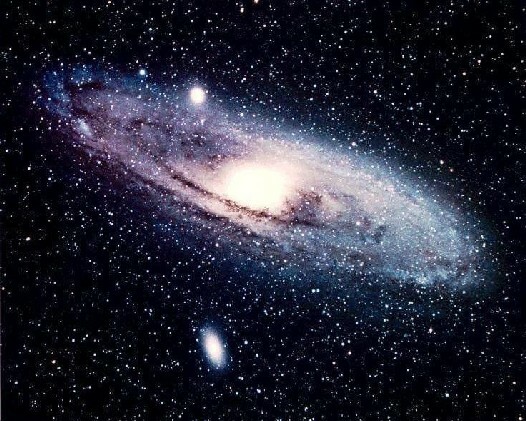 The above image is of the Andromeda spiral galaxy. What has it to do with winning the National Lottery? Answer: the numbers concerning both are astronomic. The other day, we were in the Co-Op and a lady was having a discussion with the check out lady about the different types of voluntary taxation offered by the operator Camelot. The assistant explained to that lady that she understood very little about the lottery and asked for her colleague to come over to help the lady whilst she got on with dealing with other customers. When eventually we were able to pay for our goods we commented about the variety of “games” available to those punters who presumably “feel lucky.” The lady responded that she never played the lottery but both her two adult sons did each of whom spent £40 every week! £20 on Wednesdays and £20 on Saturdays. Thus, on the basis of pro bono publico, the British Gazette offers this explanation as to how to calculate the odds of winning the Wednesday or the Saturday lottery. As you may or may not know the draws for the Wednesday and Saturday Lotto comprise a random draw of six numbers in the form of balls. There are 49 balls, numbered 1 to 49. Thus when the first ball is drawn it is 1 ball drawn from 49 balls. When the second ball is drawn it is from 48 remaining balls. When the third ball is drawn it is from 47 remaining balls. When the fourth ball is drawn it is from 46 remaining balls. When the fifth ball is drawn it is from 45 remaining balls, and when the sixth ball is drawn it is from 44 remaining balls. Where two or more people either select of have a random selection presented to them in the form of a “Lucky Dip” ticket, the odds of these identical tickets are exactly the same as they comprise in effect the same entry. The difference being that should these tickets become the winning tickets the prize is shared equally between the multiple holders. If I buy two tickets, I double my chances. Thus, odds of 1 in nearly 14 million, become 2 in 14 million, in other words, 1 in 7 million! Each lottery ticket must be viewed as a discrete random draw of six numbers that have been entered into the draw. Thus each ticket whatever the numerical selection of numbers has exactly the same chance of corresponding to the numbers drawn by the lottery machine. Thus the odds of one ticket winning are 1 in 13,983,816. The odds that one of the two lottery tickets purchased are 1 in 13,983,816 minus 1 or 1 in 13,983,815! So for a doubling of your stake you have increased your chances of winning the lottery by approximately 0.000007152 percent! If you thought odds of nearly 14 million to 1 were long, these are nothing when compared to the odds of winning the Euromillions draw! Up to Friday 6th May 2011 the draw for this exercise in futile hope was once a week late on a Friday night and comprised two random draws, one of five numbers out of a selection of 50 and a second of two numbers out of a selection of 9. Thus the odds of winning are: 1 in 76,275,360!!!! Thus the odds of winning are: 1 in 116,534,880!!!! These are hardly prudent investments! It is because so many disregard or are ignorant of this that many regard lotteries as a tax on fools! Yes! Camelot are correct. By the way a 3 in 45,057,474 chance is the same as 1 in 15,019,158 not 1 in 11.25 million. I am trying to make and informed choice on how to spend my monthly budget for playing games . If I buy on lotto ticket the odds of winning are 1 in 45 million if I buy two tickets are the odds 1 in 22.5 million and if I by three are the odds 1 in 11.25 million and so on. Please accept my apologies for the delay in my response. I can advise that if you buy 1 Lotto ticket you would have a 1 in 45,057,474 chance of winning the jackpot. However, if you bought 2 Lotto tickets you would have a 2 in 45,057,474 chance of winning the jackpot and a 3 in 45,057,474 chance of winning if you bought 3 Lotto tickets. I hope the above has been helpful but if you have any further queries, please do contact us again.